The Realm FS6 offers spacious living with four slideouts. A royal kingdom awaits inside this 45-foot quad-slideout motorhome built on the Spartan K3GT chassis. Foretravel is a respected name among many RVers who own or aspire to a high-line motorhome. 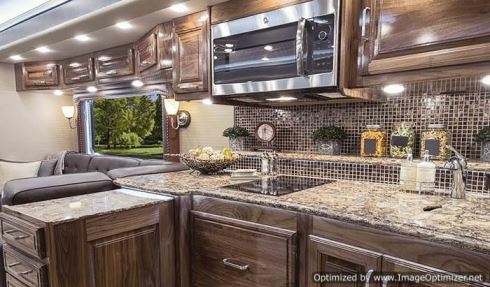 The company has remained committed to quality construction throughout its 45-year history, as evidenced by its luxurious ih-45 motorhome series (the ih stands for Iron Horse). Yet a sizable gap exists between the typical high-end motorhome that sells in the $500,000 range and Foretravel’s $1.3 million-dollar ih-45. That’s why Foretravel and Motor Home Specialists of Alvarado, Texas, partnered to create another option. 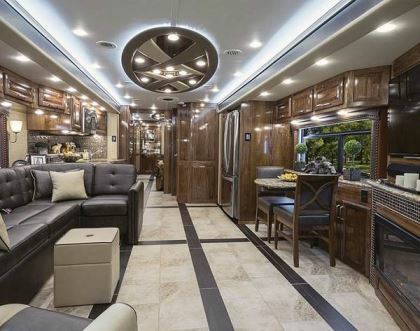 Donny O’Banion and a team from Motor Home Specialists came up with the design criteria, and Foretravel technicians and craftspeople built the coach to their exacting standards. The result: the 45-foot Realm FS6, which is offered at an advertised price point around $700,000. 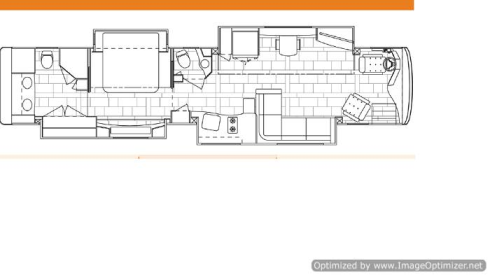 The Realm is available in four quad-slideout floor plans, including a bunk bed model. I reviewed the LV-3, a bath-and-a-half design with a large bedroom slideout and a wide wardrobe. Foretravel normally builds its own custom chassis, but to meet the targeted selling price for the Realm, company designers elected to use the Spartan K3GT. This zero-camber chassis with a trussed torque-box frame is considered a premier foundation. The K3GT includes a passive-steer tag axle, which yields a 7 percent reduction in the curb-to-curb turning radius. 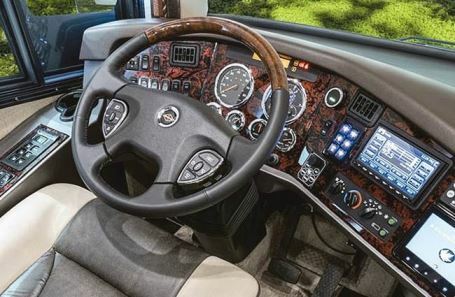 A 200-gallon fuel tank, six-wheel disc brakes, a 20,000-pound towing hitch, and a TRW power tilt and telescopic steering wheel are standard. A Hadley self-leveling air suspension system and HWH leveling jacks provide a choice of leveling methods when parked. Safety features include a Fogmaker North America automatic fire-suppression system for the engine compartment, with a dash-mounted alarm, as well as Tyron bead-lock tire blowout protection on the front axle to provide greater control in the event of a tire failure. Having enough power to get up and go isn’t an issue with the Realm. A 600-horsepower Cummins ISX15 engine outputs 1,950 pound-feet of torque through an Allison 4000 MH six-speed automatic transmission. Automatic traction control ensures that you’ll get that power to the ground regardless of road conditions. A 14,000-pound tag axle, a 20,000-pound front axle with independent front suspension, and a 23,000-pound drive axle combine to give the Realm a 54,000-pound gross vehicle weight rating (GVWR) and a 77,000-pound gross combination weight rating (GCWR). 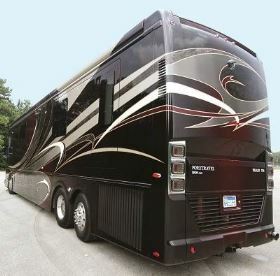 The coach has an occupant and cargo carrying capacity (OCCC) of 4,142 pounds. At the scales, the test coach weighed 47,080 pounds, with 16,940 on the front axle, 18,620 pounds on the drive axle, and 11,520 pounds on the tag axle. The Realm was weighed with full fuel and water but not with full cargo; however, excess capacity is plentiful, so loading up the coach shouldn’t be a problem. The rear axles are fitted with Michelin 315/80R22.5 LRL tires, while the steer axle is equipped with 365/70R22.5 LRL tires. Foretravel motorhomes are known for their exacting construction, and the Realm is no different. Steel framing in the walls, roof, front cage, and flooring trusses provides strength and safety. The fully laminated roof, walls, and floors incorporate a Dow structural foam board. The flooring system is 6 3/4 inches thick, which offers excellent insulation and sound absorption. The one-piece Cosmolite roof is a thermoplastic substrate said to be superior to fiberglass. It resists rot, corrosion, and mildew; absorbs energy better than lauan; and has less thermal expansion, according to product literature. Foretravel’s front and rear fiberglass caps are made with a cross-weave mesh similar to that used in plywood, which results in a stronger product. Frameless dual-pane windows are used throughout the coach. The hydraulically operated HWH slideout rooms incorporate Foretravel’s own Fore-Slide technology. The slideouts are flush with the sidewalls when retracted. A pneumatic seal expands when a slideout is extended or retracted; this closes any gaps, resulting in an airtight seal, with no whistling noises when the coach is driven. In addition, a filler panel rises up from the floor to seal any gaps. This process produces a flat floor whether the slideout is extended or retracted, and no overhanging carpeted edges. The entire system is automated; a simple key twist and button push activate it. The slide rooms are fully laminated and assembled with curved extruded aluminum corners that offer exceptional strength and a clean, attractive appearance. The Realm’s exterior is striking. High-gloss full-body paint with seven coats of hand-sanded clear coat cover the entire motorhome. The extensive fades and marbling effect take 650 man-hours to apply. Even the tops of the slideouts are painted. My test unit was finished in Raven Red. RealmAir dual overhead fairings help manage the aerodynamics of air flowing over the coach. Chrome accents adorn the front and rear caps, offering a distinctive styling that is modern, yet subtle. Xenon headlights help cut through the darkness when driving at night; they are surrounded by haloed LED accents. Additional LED under-body lighting makes the coach easy to find when returning from an evening campfire gathering. The side-hinged basement compartment doors are generously sized yet can be operated with ease. Large Girard awnings are flush-mounted into the upper fascia, producing a sleek and aerodynamic appearance. The cockpit is equipped with comfortable six-way power seats. The instrument panel is well organized; all of the switches and controls are visible and easily within reach. The Xite infotainment center and navigation system incorporates Rand McNally GPS software designed for RVs. An auxiliary display monitor is located at the passenger’s seat. The color monitor interfaces with the side and rear cameras; it switches automatically with the turn signals to display images from the mirror-mounted side cameras when active. The Total Vision rear camera system utilizes a movable camera mounted inside a globe at the rear of the motorhome. This camera can be operated from a remote-control panel on the dash. Automatic settings are programmed to two buttons. One button enables the camera to view the hitch, which is great for backing up or for checking the tow bar connection. The road-view button directs the camera to look farther back down the road, with a view similar to that provided by a rearview mirror. A SilverLeaf computer can overlay trip information as well as engine performance parameters right on the rear camera monitor. The tire pressure monitoring system also interfaces with this system. An optional iPad interface communicates through the standard Wi-Fi Ranger Ultimate Pack, which provides a secure wireless network for connection to campground Wi-Fi or cellular service. A Spyder multiplex wiring system consists of a number of control panels located throughout the coach to operate lighting and the various power window shades. The living area of the LV-3 that I inspected easily met Foretravel’s standards of luxury and refinement. The interior featured the Buckingham Black décor package, with satin-finished walnut woodwork. Gloss walnut and satin-finished African mahogany are also available cabinetry choices, along with two other décor packages. Quartz countertops feature LED lighting along the edges for additional ambience. An angled entertainment center in the front of the driver’s-side slideout houses a fireplace surrounded by inlaid ceramic tile. A 52-inch Sony HD LED TV rises out of the entertainment center via a power lift. T he Winegard HD satellite dish, Blu-ray player, satellite DVRs, and other electronic equipment are placed in a rack-mounted enclosure. Coach occupants can relax in this area while seated on the L-shaped curbside sofa. The galley is equipped with a drawer-style dishwasher and top-end residential appliances. A GE Advantium convection-microwave oven and an electric glass cooktop cover meal preparation. The galley also is equipped with a slide-out workstation. An attractive ceramic-tiled backsplash covers the entire wall behind the galley counter and protects it from food splatter. The various galley cabinets and drawers are roomy. The opposite wall contains a large Kenmore residential refrigerator, which is flanked by a spacious pantry and an attractive dining table with two freestanding chairs. As one moves rearward, the half bath is next in line; it is roomy and bright, without a closed-in feeling. A sliding door separates this part of the coach from the bedroom. All sliding doors in the Realm, as well as the slide-out galley workstation, are automatically secured by electromagnetic locks during travel to keep them in place and prevent any unwanted movement. In the bedroom, cabinetry opposite the comfortable king-size bed holds another 52-inch Sony LED TV on a power lift. A large window behind it lets in plenty of light when the TV is lowered. The rear bath is a comparatively short 2-inch step up from the bedroom — less than the 5- to 6-inch step found in most rear-bath designs. A tiled shower enclosure and a toilet are located on the driver’s-side wall. 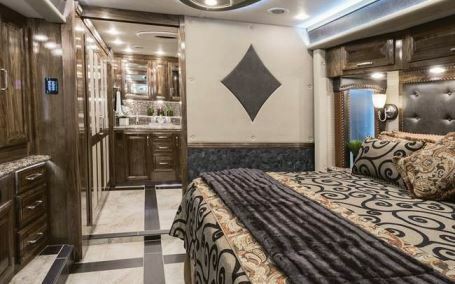 In most rear-bath floor plans, a wardrobe runs along the motorhome’s back wall, and the vanity resides against a sidewall. The Realm LV-3 floor plan breaks from that tradition. Foretravel designers have placed an expansive wardrobe on the curbside wall, in the same slideout as the bedroom dresser. This configuration expands the bathroom floor area and creates a spot for the vanity against the rear wall. As elsewhere in the test coach, the vanity featured walnut woodwork, a quartz top, a raised ledge, and a tiled backsplash, with mirrored cabinets above. An Onan 12,500-watt diesel generator on a power slide provides plenty of AC power when shore power is not available; the unit is equipped with an automatic generator-start module. Two Outback 2,800-watt true sine wave inverter/chargers produce additional power when the generator is not needed; they are powered by a bank of six large Group 8G4D 12-volt gel batteries. A 50-amp power cord reel is located in the same compartment as the Aqua-Hot 450D hydronic heating system, the automatic transfer switch, and a power hose reel for the coach’s fresh water supply. An adjacent compartment holds the usual control valves, a handheld shower attachment, and a Waste Master sewer drain hose with a cam-lock fitting. Fresh water tank capacity is 127 gallons, while black water capacity is 56 gallons and gray water is a generous 115 gallons. The compartment opposite the Aqua-Hot holds a number of networked modules that control various operations via a touch-screen panel — part of SilverLeaf’s Total Coach system. The water pump and water distribution manifold are also located in this area. Interior heating needs are met by the Aqua-Hot system, as well as the electric fireplace and heated tile floors. The hydronic system also heats the basement to prevent freezing in cold temperatures; an engine preheat function warms the engine on cold days. Cooling is handled by three 15,000-Btu rooftop air conditioners with heat pumps. The whisper-quiet airflow is complemented by hidden return ducts behind the decorative mirrored ceiling fixture. Driving the Realm was enjoyable. I expected the Spartan K3GT chassis to live up to its reputation as the king of the road, and it did not let me down. With 600 horsepower under my foot, merging into traffic was effortless. The rolling hills of Texas seemed to flatten out as the motorhome took them in stride. The three-speed engine compression brake easily slowed the coach. When the six-wheel disc brakes were used, they required very little pedal pressure. If a sudden stop is needed, those brakes readily will comply. Handling was nice and crisp. The heavy-duty Bilstein shocks kept roll to a minimum and did an excellent job of absorbing any bumps or dips. Thanks to its solid construction and insulation properties, the Realm was a nice, tight unit that exhibited no squeaks or rattles when on the road. Though that big 15-liter engine could be heard, it was barely audible. The 46-mm Bilstein shocks on all six wheel positions delivered a smooth and comfortable ride. Unlike my experiences with many other motorhomes, I didn’t want to get out of the driver’s seat after a long day’s journey. Overall, the Realm FS6 nicely combines quality, performance, and luxury in its price range.